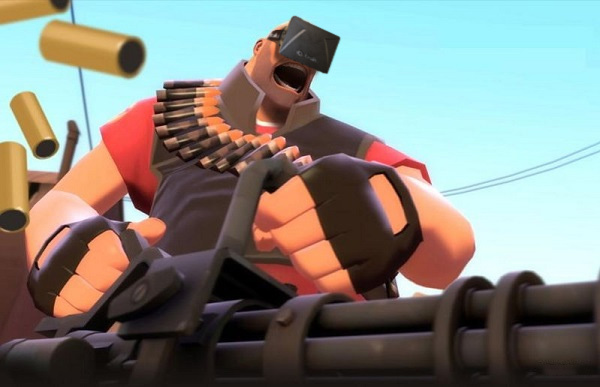 If you follow tech or gaming news you would know that the Oculus Rift is a virtual reality headset with a wide field of view and low latency head tracking. If you had no idea, now you know! I became aware of this device when the Kickstarter launched back in August last year. As I at the time had no real income I hesitated backing the $300 for a week, but then came to the conclusion that I wouldn’t be able to survive without getting it, so I pledged. Just this week I got a message that my Rift would ship with the next batch, which I hope means soon. The entire back story of this product is amazing and inspiring, I’ll try to summarize it real short, with reservations for factual errors as I am writing all this from memory! 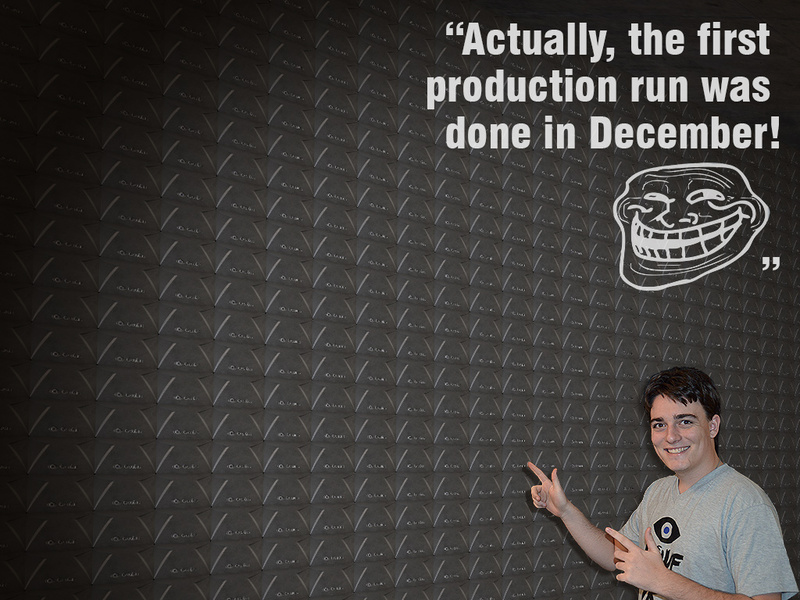 Palmer Luckey tinkers with VR gear while being home schooled. As long as he could ace the national tests he could spend his time as he wanted, thus hardware hacking. Much of the money he earned repairing phones was spent on computers and virtual reality gear. He fluked out of journalism and started working on VR in a lab funded by the army. 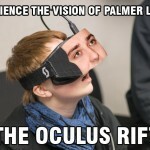 As Palmer could not find any head mounted display that let him enter the Matrix he began developing his own. This resulted in prototypes he posted about on enthusiast forum(s). When he had a revision he was satisfied with he planned to start a small Kickstarter project for self-assembly kits. Programmer legend John Carmack who had a break from normal duties and time to mess with VR saw his prototype and asked to buy one. Palmer did not think twice and sent him his only prototype just like that. This is where things get crazy. John Carmack taped a sensor to the prototype and mounted it all in the frame of a pair of ski goggles, then integrated support for it into Doom 3 BFG which was due for remastering. He then brought this setup to E3 2012 and demonstrated it for the press. This did shake things up and probably led to what happened next. 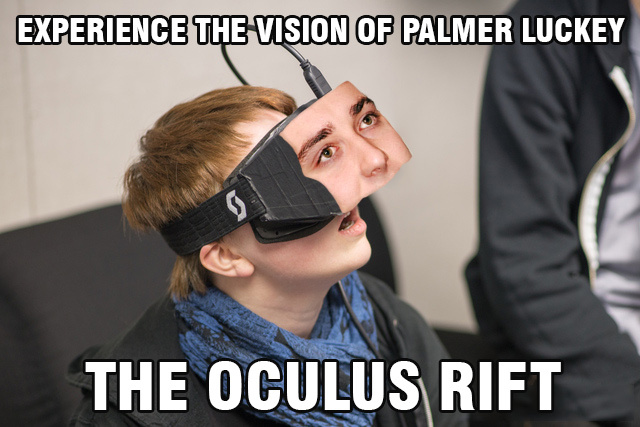 The Kickstarter launch was a bit delayed, because Palmer was no longer a lone guy but had more people in his startup Oculus VR, and they were getting some incredible people to vouch for their tech. When the project did launch the Internet exploded and they finally ended up with almost 10 times the original amount asked for, close to $2.5 million. The interest for VR suddenly got revived and this generated some really interesting talks on QuakeCon, John Carmack’s keynote and then the Virtual Insanity panel. People who got to try the Rift raved with how awesome it was, and well, I can say I have been hyped on this since the first day of the Kickstarter. 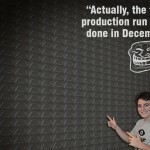 Post-Kickstarter Oculus VR has picked up more employees, another $2.5 million in funding, has started to produce development kits in China and since March have been shipping them to developers all around the world. At the same time they have been to multiple shows everywhere to show off the tech. Some great recorded reactions are Grandma visiting Tuscany, Norweigan Dagbladet Rollercoasting, Hydra Tuscany by Sixense, Cymatic Bruce testing demos, Davis Daily CES13 reactions and Kotaku Australia hands on. So, why do I bring this up? Well just now I was about to post a bunch of Photoshop jobs I did for a thread on MTBS3D.com, and it kind of needed an introduction, which as you might have noticed became a bit more serious than I had planned. Anyway, first the Photoshop thread was just for fun, but it got turned into a contest with a prize by the site admin, more on that later. Now on to the imagery! 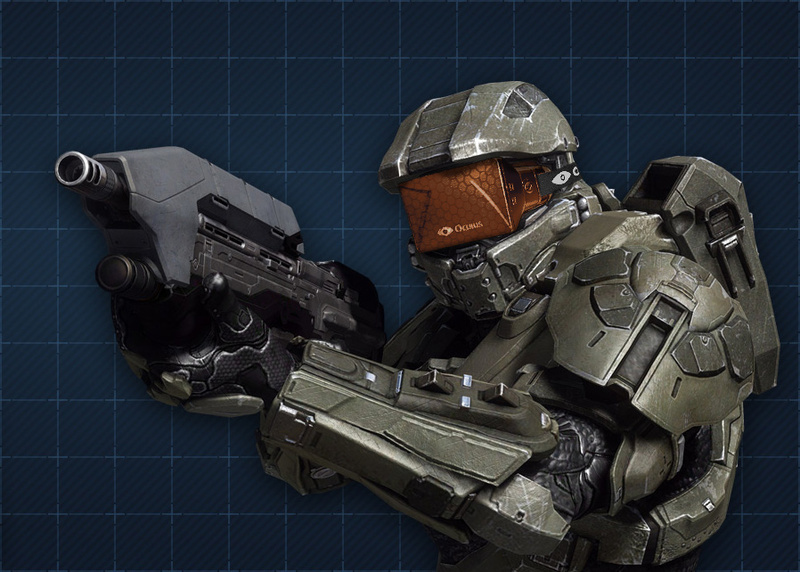 The first image I did was of course based on Halo, as that is a big part of my online community history. 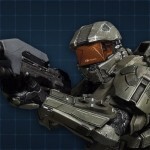 This is the Master Chief with his visor exchanged for a Rift devkit. I extracted the Rift from one of the few available images and distorted it to fit in the helmet. I actually reversed the image and then the logotype and cut the side up… way too serious. In the end I also created a displacement map for the bumps and applied that to the honeycomb pattern overlaid on top. 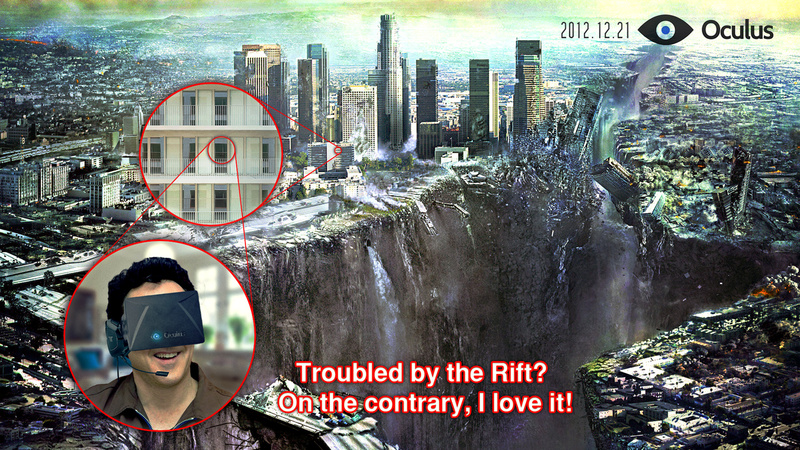 Of course I would love to play Halo in the Rift, but I’m not sure that will ever happen. This was an idea in my head I could not let go of, and the last image (view full) was part of the motivation, because I knew it existed. I will not spoil what the point of the joke is here in the description, just check it out :P To put together this one I actually stepped through this sequence in the movie and did screen captures to get the views I wanted. The actual photoshopping was not so much more than framing and some small adjustments. 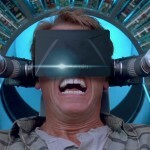 This was a play on yet another VR movie, Total Recall, and of course shows how it hopefully not is to wear the Rift. This was a quick job with basic adjustments like color balance, brightness/contrast and overlaying a lens flare. 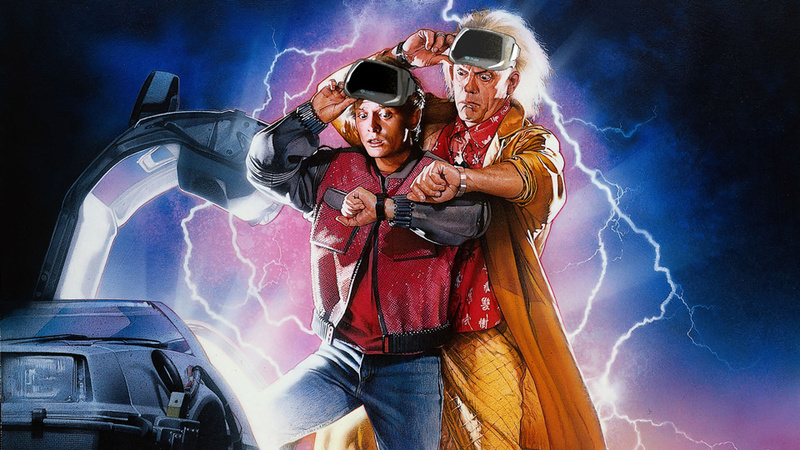 Trying to tie in popular culture a bit more I put the Rift into Back to the Future. I wanted to add some catchy subtitle by late at night I was not in shape to come up with that :P As it would show later this was a fairly pointless image with just nice photoshopping, when it was remade by someone in the forum where Palmer’s and Carmack’s faces were inserted it got very popular, more on this later! 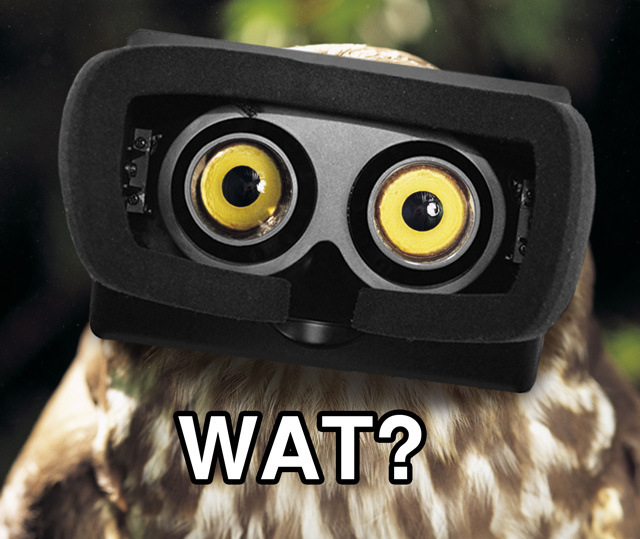 With all the news being reported that included factual errors, like the Rift having two separate displays or positional tracking, I was inspired to create a stupid picture where an owl wore the Rift backwards, which is physically impossible to boot as the display would be in the way. 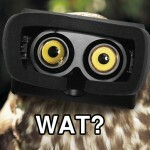 Funny enough the owl’s eyes fit almost perfectly in the lens sockets of the Rift, which made it quite funny :D Then I just added some shadows and was done with it! This took me forever! Looking for nice images with angles matching the few images that existed of the Rift, coming up with titles that made sense and followed a theme, adjusting colors, contrast, etc separately between the four images… it was way too much work to be motivated, but as I had already started I finished it! 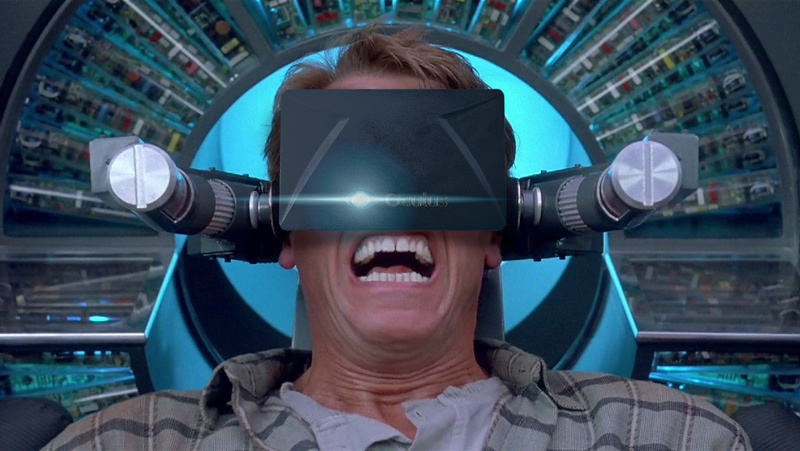 It’s supposed to show that using the Rift is so immersive the people using it does not realize they are actually not just using the Rift… perhaps a long shot. 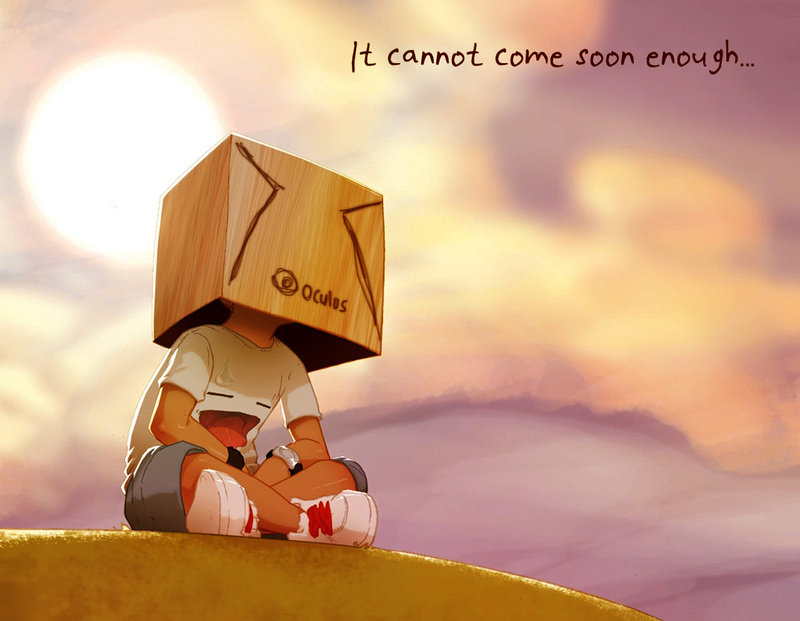 Oh, this one. I think it has a lot of subtlety that perhaps was not picked up by everyone. I posted it on the supposed day of the apocalypse, 21st of December 2012. 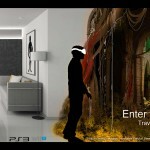 I took a picture from the movie 2012 showing a rift, the geological term, with someone donning the Oculus Rift in a house nere the rift talking in a headset obviously misinterpreting what is being said. This someone is actually the main actor from the movie, John Cusack. A little by random I ended up placing the Oculus VR logo just above the start of the rift, which kind of makes that into an Oculus Rift too. Here I again spent an obscene amount of time trying to find good source material, then it was mostly a matter of placing things where it made sense and adjusting colors/contrast. In a few of the photos available of the Rift an adjustment dial was visible. At this time it was not public information what this dial actually did, so I was free to make up what it could mean. Using urban dictionary I found a few of the words, but I had to make up a number of them myself. I tried not repeating any of the parts they were built of which was a challenge. It is also a little funny that it goes to 11, but in reality it goes from -5 to +5. It was actually this image that won me a prize in the contest! 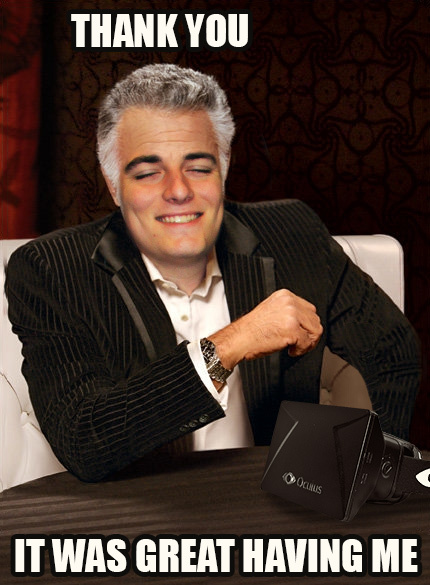 Not the grand prize, but a prize nonetheless ;) The fun part is that it was also one of my quickest jobs, just turning the original into evening time and replacing the face on the box with the face of a Rift. I think it got included as it kind of resonated with how many of us felt at that time :D Right now the wait is not so calm, but more like running around in circles clawing at the walls. This is the last one that required some effort and which ended up satisfactory, also based on the same photo as one of my earlier favorites. After a thread on MTBS3D where we discussed how we could decorate the face of the Rift I came up with this. 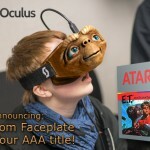 Instead of a part of Palmer’s face I have glued on the entirety of E.T’s face, also kind of ironically referencing the game Atari released that was not that great. Still, custom Rift skins sounds like fun, right? I made this one for Road To VR, a site with superbly good VR coverage and a very nice logo, ehem! 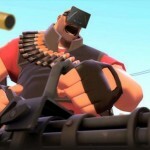 The character is the Heavy from Team Fortress 2, a very polished team shooter by Valve. The reason for this was the listing of a talk for GDC where they were going to talk about the challenges porting TF2 to virtual reality. 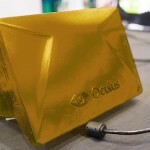 This was before they had announced the support of the Oculus Rift which now is in the live game! Just seeing this image I cannot remember why I did this one. Reading up on old posts I saw that I made it to jokingly suggest what the prize of the contest had been upgraded to. By this time I was making great efforts to learn Java in a new class and did not really have time to do many more photoshops, this was a fairly quick job with a gradient map and lightening up shadows. My motivation to do these Photoshops was partially because the access to images of the Rift was very limited. Not much was out there, which made it feel kind of exclusive and made it challenging to use those few images to create stuff. Now when the kit is out and it’s easy to take all the photos you want, it’s not really as interesting :P And things will not come as naturally, as the possibilities went from quite boxed in to unlimited. 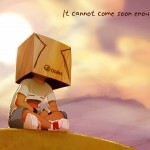 I work much better within constraints, for some reason. My brain was working in a mode to create stuff that would be entertaining for as many people as possible, the general public. I forgot that inside humor is always the best, and that I was in a tight online community. 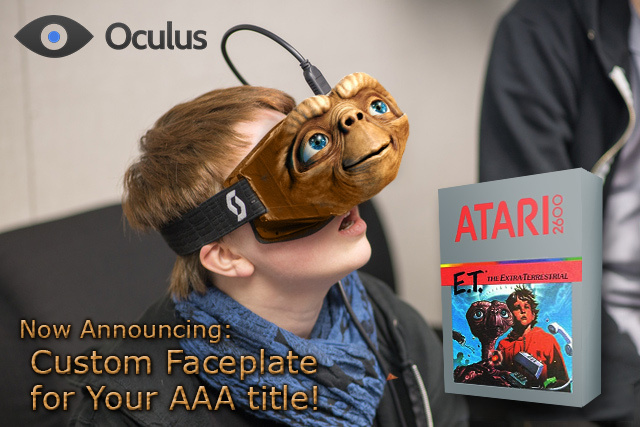 As you might have noticed this really saturated the entire contest :D When it was announced on the front page a face replace image was used as the cover. 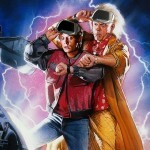 When my Back to the Future image was altered (with permission) it got way more popular. 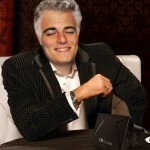 And finally the grand prize winner was an image that brought face replace to new heights with what, nine replaced faces? 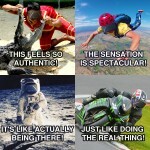 Now in retrospect I find it fairly hilarious how things worked out :) And I also appreciate the face-replace images more! 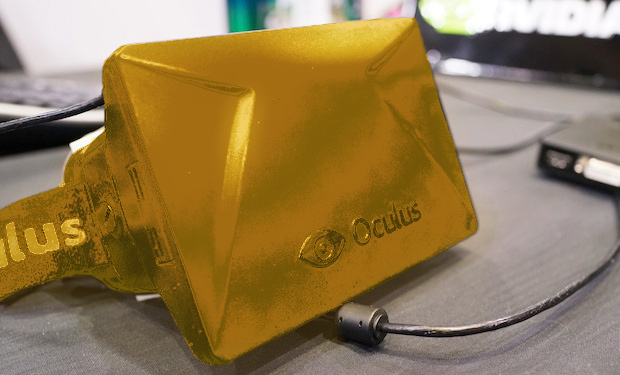 A last note on the Oculus Rift. I have tons of ideas I want to try, but who knows how much I will be able to experiment, it would involve learning a game engine which is no small task. Right now my mind is preoccupied by finding somewhere to live as I’m starting a new job in a new city in less than a months time, but I definitely want to fiddle with native Rift games in both first and third person, playback and recording of spherical video leading to telepresence… I will have to find time for some of this eventually, haha! There will probably be much more on the Rift later on. 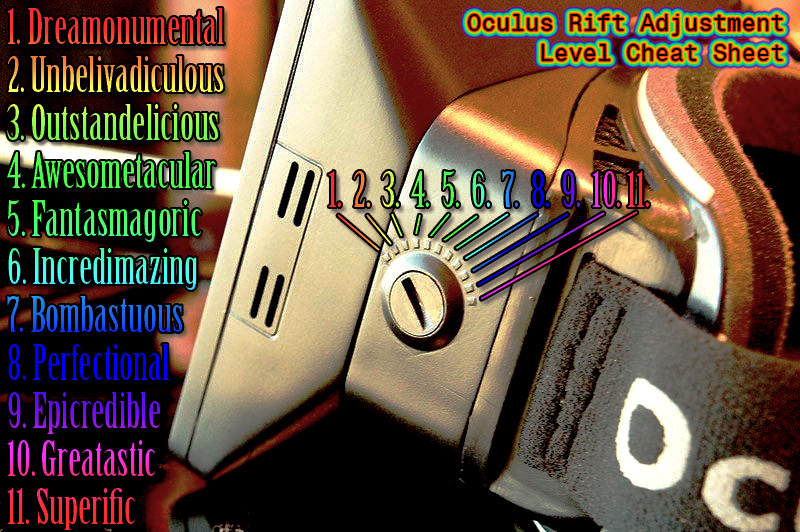 This entry was posted in Creative, Gaming, Internet, Virtual Reality and tagged Oculus Rift, Photoshop. Bookmark the permalink. 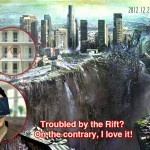 So, any news on the “ZOMG-the-Rift-arrived!! !” front? Got it two days ago :) I will write something up when I get the time, my life has been crazy-hectic lately!